Earlier this year I attended an annual science fiction and fantasy convention in the Boston area. Rather to my surprise, there were no panels on climate change. Even in the last few years when a few such panels had been on the agenda, I had the impression that “speculative fiction and climate” was a niche interest rather than something central to a genre that has a near-monopoly on apocalyptic scenarios. The liveliness of the convention, its continuing concerns with interesting and worthy issues ranging from utopia to racism to international roots of spec fic—all this against the conspicuous absence of discussions on climate change—brought to mind the Yale Program on Climate Communication report “Is There a Climate Spiral of Silence in America?”. According to this study, even among those who are interested in climate change or find it important (two-thirds of Americans), more than half do not generally talk about it. Thus this phenomenon that I noticed in the convention is not restricted to spec fic aficionados but is a feature of the wider society—in America, and possibly the world. Amitav Ghosh, in his relatively brief but urgent book, The Great Derangement: Climate Change and the Unthinkable, offers some possible ways to understand this silence, via excursions through the history of the modern novel, the inadequacy (as he claims) of science fiction to handle the ongoing climate crisis, and reflections on historical and political forces that have brought us to this moment in time. The essays are drawn from lectures given at the University of Chicago in 2015, and their titles—“Stories,” “History,” and “Politics”—are arranged in the Contents page at the corners of a triangle. The nonlinear placement of these topics suggests a concept map of overlapping ideas, as well as the possibility that the essays may be read in any order, which is more or less borne out when one reads the book. Amitav Ghosh is a highly acclaimed Indian writer in English, whose literary fiction is deeply grounded in historical and geographical research. His nonfiction is equally respected, from the 1992 work In an Antique Land to his 2016 book on climate change. I have read some of his novels, my favorite in fiction so far being The Hungry Tide. Ghosh’s concerns and fascinations are wonderfully non-Eurocentric and richly informed by history—nor do they play to Western stereotypes or expectations, a constant danger for Indian writers in English. His 1995 novel The Calcutta Chromosome won the Arthur C. Clarke award (he does not regard it as science fiction, despite his avowed fondness for the genre). I come to The Great Derangement as a writer of science fiction, a physicist with a particle physics background working in the past few years on interdisciplinary scholarship of climate change, and an Indian of the same generation who was a student at Delhi University around the time that Amitav Ghosh was there (although our circles crossed briefly, I didn’t know of him until I read his works decades later). My ongoing explorations of the climate crisis are at the intersection of science, pedagogy, sociology, philosophy, history, politics, and economics. Because climate change is a subject close to my heart and my work (in and outside of fiction) this is not a review so much as a commentary and a reflection. Running through the book as a whole is the idea of modernity—a term that connotes the ideas of individualism and freedom, the questioning of tradition, the notion of linear time going toward increased progress, a sense of the novelty of the future, and a rupture with the past. Not to be modern is to be old-fashioned, backward, barbaric, uncivilized. However, as Ghosh takes pains to point out, viewed in another light, modernity is a deeply problematic notion. Its basis is the separation of humankind from the rest of Nature—the creation of the idea of Nature as a collection of natural resources separate from and subject to the project of human civilization—the Nature/ Culture divide that also put the sciences in one realm and literature in the other (so eloquently expressed by C. P. Snow in The Two Cultures ). In the first essay, Ghosh traces the consequences of this separation on literature. Once, scientific works and literary works cross-pollinated each other; once, you could have sprawling, highly populated sagas filled with drama and romance, such as the works of Dickens and Tolstoy—but as the split widened, and as a certain uniformity came into the lives of the middle and upper classes, the novel became focused on the interior landscape of one or a few individuals, and moreover, excluded the non-human. Ghosh uses a metaphor fashioned from the history of geology to describe this shift—originally we had literary catastrophism, with its dramas, human and natural, rooted in the age-old experience of being human in a very large universe. Eventually this gave way to uniformitarianism—a literature that celebrated the quotidian, mimicking the steady, predictable nature of modern urban bourgeois life—what I would call a normal-distribution mindset. Thrown out of the respectable house of literary fiction through this “purification process” into the ghetto of genre were literatures that came to be known as science fiction, fantasy, magical realism, and the like. Mary Shelley began to write Frankenstein the year after the eruption of Mt. Tambora in 1815; it was only retrospectively that it was considered science fiction. Ironically the very processes that brought us to modern industrial civilization—a fairly steady, moderate climate for about 12,000 years (the Holocene), and particularly the more recent development of the fossil fuel economy about 150 years ago—allowed literary fiction the delusion that the rest of Nature was irrelevant. Ghosh refers to the French philosopher Bruno Latour’s criticism of modernity in this context. The trouble with climate change, Ghosh says, is its uncanny aspect. Its extremes—superstorms, droughts, floods, sea level rise—are so beyond the conceptual grasp of modern literary fiction that it is a rare author who wrestles with it. While it might seem natural that climate change should therefore be the province of imaginative literature—science fiction and fantasy—Ghosh argues that it is not so. Unfortunately he takes a quote of Margaret Atwood’s (regarding science fiction and speculative fiction as means to transport us to other worlds) as a guide to his logic. SF can’t address global warming, he says, because the problem is set in our world and time, “it is precisely not an imagined ‘other’ world apart from ours, nor is it located in another ‘time’ or another ‘dimension.’” He suggests also that to write climate change as imaginative literature is an ethical violation. Having given up on both mainstream literature and imaginative literature, Ghosh explores the possibility that the problem might be language itself. Referring to anthropologist Eduardo Kohn’s book How Forests Think: Toward an Anthropology Beyond the Human, he suggests that thinking through images might be a better means to convey, conceptualize, and engage with the climate crisis. I happen to be reading Kohn’s book for the second time (an astonishingly riveting book, but with ideas so deep and slippery as to deserve multiple perusals) and I think that Ghosh is right as to its relevance. But I disagree with him on climate change and speculative fiction (which latter I define for this purpose to be an umbrella word covering science fiction, fantasy, slipstream, magical realism, etc., and use interchangeably with “imaginative literature”). Speculative fiction’s what-if experiments allow us to imagine the effects of certain technologies, or social arrangements, in negotiating our uncertain future. A great recent example of this is Kim Stanley Robinson’s New York 2140, a flawed, sprawling, brilliant novel about life and revolution in a drowned future New York: rendered in multiple voices, anchored by fascinating descriptions of the minutiae of everyday life, this story of lives inseparably entwined with each other, the city, the past and the future, and not least with the moods and rhythms of the great ocean, displays a moral courage and an imaginative exuberance of a kind unique to spec fic. In addition there are other works, from veterans of the field, such as Octavia Butler (Parable of the Sower) and Ursula K. Le Guin (The New Atlantis) and a host of newer writers such as Emmi Itäranta (Memory of Water), who explore climate-changed worlds and help establish that tradition in SF. Actually the very point Ghosh makes about the inadequacy of language suggests the relevance of speculative fiction. Kohn’s argument in his book is that language is only one of three categories of communication through signals or signs. Through his categorization of semiotics as iconic (the most basic category, where one thing signals another through a lack of distinction between them), indexical (an association of icons that points to some significance beyond the icons themselves), and finally, symbolic (best exemplified by language), he aims to provincialize language; the modernist tendency to hold language above everything else is to be blind to the fact that there are other ways of communication that are beyond language, perhaps even an inter-species pidgin. But language as used in literature can be more than literal too, and not only by way of metaphor, symbol, allegory, analogy, and suchlike. These latter are well known ways in which speculative fiction, to invoke Emily Dickinson, tells the truth but tells it slant. Ghosh’s interpretation of Atwood’s statement that science fiction transports us to other worlds—his conclusion that spec fic therefore disqualifies itself from being able to address ours—is stupendously literal. Of course a climate-changed world is “another world” from the one we think we know. Science fiction at its best has always been about this world, our world, even when it is set in the far future, on a distant planet. By bringing to light real-world phenomena, through its imaginative “what-if” questions, it interrogates the present moment and posits alternative scenarios, technological, social, political. As Ursula K. Le Guin puts it, “Science fiction is not predictive; it is descriptive.” I can think of a number of works that demonstrate this: Samuel Delany’s Stars in My Pocket Like Grains of Sand, or Manjula Padmanabhan’s Escape, for example. But I speculate that words might do even more. I remember, decades ago, my first exposure to the kind of poetry in which the words didn’t make much literal sense but the choices and juxtapositions of words, their sounds and emphases created in me a mood, evoked certain emotions and associations. Surely it is possible that the best writers of imaginative literature do something similar, where the narrative itself transcends the limitations of language to create icons and indexical signs, to use words to do what words cannot do, to speak between the lines to our unconscious minds (I’m thinking here of some early essays by Le Guin collected in The Language of the Night that might have served Ghosh better in understanding the potential of imaginative literature). I can only presume, since Ghosh does not elaborate, that the ethical argument against spec fic engaging with climate change is that somehow the use of fantastic tropes to describe something as serious as climate would be to trivialize it, to belittle the genuine real-world sufferings of millions of people. But this is as true of any literature as it might be of spec fic. Truly great works of literature of any kind—realist or spec fic—treat serious subjects with the honor they deserve. Thus nuclear war is serious stuff, as is gender, as is totalitarianism—but can we conclude then that Walter Miller’s Canticle for Leibowitz or Le Guin’s Left Hand of Darkness, or Yevgeny Zamyatin’s We fail to honor that seriousness by using the tools of spec fic? And surely it is also true that nonmaterial things—like paradigms, certain emotional states, phenomena beyond the individual human such as mob behavior, theories of economics—have material consequences, and therefore have their own reality. What epics (and the best spec fic works) do so well is to give these nonmaterial realities aspects of larger-than-life beings, which might allow the reader to engage with them more creatively. Climate change has both a material and nonmaterial aspect. I’ve argued before that the world we live in—call it reality if you wish—is so large and many-tentacled a beast that you sometimes need a vessel larger than reality to hold it. Considering the seriousness of the crisis, surely we need every means of artistic communication, language-based or otherwise, to learn how to write, speak, sing, paint, and dance climate change. (And seriously, how many people read literary fiction anyway?) Why not a polyphony instead of a solo? (I’m thinking, for example, of Chantal Bilodeau’s stunning 2014 play Sila). But to me the value of Ghosh’s dismissal of science fiction in this essay is to challenge our ability to negotiate the landscape of the apocalypse before and as it is unfolding instead of after. It is certainly the case that some spec fic authors have been thinking about and writing about climate change for a while. There are valiant attempts and brave failures, as we negotiate this new world with our old words and concepts. But these works are niche interests even within the spec fic community, and beyond it they rarely get the critical attention they deserve. Barbara Kingsolver’s realist Flight Behavior is a great book, but it has its limits, and where it is limited is precisely where science fiction can step in. I remember going to my public library’s book club discussion of the book when it first came out. The women who gathered to discuss the book (and they were all women) loved it fiercely, but had no idea of the severity of the climate crisis, or that it wasn’t inevitable but created by socio-economic and historical forces. That’s less a failing of the book—which after all, isn’t intended to be a thesis on climate change—than another symptom of the silence around the subject in literature as well as the public sphere. But it is also an indictment of the failure of mainstream literature to expand the mind in the radical way that the best spec fic does. The essay on history is the shortest in The Great Derangement. Like most serious students of climate history, Ghosh has no quarrel with the charge that capitalism is the chief culprit. However he argues that empire—or colonialism—is equally important, and that the relationship between capitalism and empire is complex. Looking through this lens, Ghosh reveals the centrality of Asia in the climate crisis in riveting detail. First, Asia is likely to suffer the worst damage in terms of the number of people affected—up to 50 million people in India and 75 million in Bangladesh would have to migrate due to sea level rise alone. But Asia is also deeply implicated in the current crisis: due to their rapid industrialization, China and India emit fossil fuels at increasing rates. China has already outpaced the US in total fossil fuel emissions, although per capita both countries are still significantly behind the West. Ghosh makes a far more complex and interesting case for climate reparations (the typical position of developing nations in climate negotiations regarding the debt owed them by the West) than the simplistic us-versus-them argument, tracing the ancient history of fossil fuel use in Asia, notably China and Myanmar, and asking the question as to why these did not result in a large-scale fossil fuel industry. The short answer is colonialism. Colonialism prevented Asian countries from developing their own fossil fuel industries (with the inadvertent effect of slowing global warming), and in fact it is the decolonizing process in countries like India and China that has resulted in the increasing rate of carbon emissions. But the decolonizing project could have gone in another direction—Ghosh quotes Gandhi from India and Zhang Shizhao from China, who recognized the unsustainability of endless growth and consumption. Alternate models of development were ultimately overcome by the forces of neoliberal capitalism, but the fact that they slowed these probably kept a significant amount of carbon from the atmosphere. Ghosh’s assertion is that modernity is not a sole Western invention, that alternate forms and variants emerged in Asia as well, but that the colonizing project and capitalism subsumed, appropriated, and modified all possibilities into the one we know today. Ghosh’s last essay—“Politics”—examines the idea of freedom, an essential aspect of modernity, which he calls the most important political conception of the modern era, central to politics, humanities, arts, and literature. Philosophers of freedom, he says, were (since the Enlightenment) concerned with how humans could escape the injustice and oppression of other humans and human systems. But implicit in the idea of freedom was freedom from the constraints of Nature, which is of course a manifestation of the Nature/Culture divide. Ironically the avant-garde, as Ghosh points out in a discussion of the role of artists in the fossil fuel economy, totally missed the boat on climate change. They did not hear what Nature was telling us (this is still true). This reminds me of Latour’s famous phrase and book title “We have never been modern,” pointing to modernity being a delusion of the most dangerous kind. I am also reminded of how freedom is cast in the West solely in individualist terms—as in the Declaration of Human Rights—worthy as it is, the idea of collective rights and responsibilities apparently has no place. But it is impossible to deal with climate change on an individual basis. Climate change is a threat to this idea of freedom, conceptually and otherwise. Part of this threat comes from agencies that have long recognized climate change as a problem—specifically a security problem. Ghosh mentions the Pentagon—the Pentagon reports on climate as a major security threat are worth reading. Weather as warfare was used by the US prior to the Geneva Convention, so the idea of climate as a driver of human events is hardly new to the military and defence think-tanks. Ghosh quotes Christian Parenti’s phrase “armed lifeboat” as a metaphor for rich countries’ plans for climate emergencies—an essential component of which is the turning away by force or obstacle of the millions of refugees that are expected to flood the West (a process that has already started). What Ghosh doesn’t mention is that climate change increases the possibility of war and conflict—as environmental conditions change and people get desperate for food and water, the chances of extremism and violence also go up dramatically. New arenas of conflict are already on the horizon—the Arctic Ocean, protected from the depredations of governments and corporations, is now ringed by vested interests as the ice melts and vast reservoirs of oil and gas become accessible. The essay analyses two crucial climate documents: the Pope’s Laudato Si and the 2015 Paris Climate Agreement. It briefly discusses the role of popular movements (which Ghosh says will take more time to build than we have). Where Ghosh finds most hope is in the possibility of people of faith and popular movements coming together. I wish that Ghosh had looked at the history of social movements in general and their potential for engendering systemic change, and then examined climate justice movements in that context. In particular the role of indigenous peoples the world over is worth bringing to light. Not only has indigenous resistance stopped or stalled fossil fuel projects, but the experience of peoples from the Dongria Kondh in India to the Standing Rock Sioux in the US reveals the brutal face of industrial civilization. Our modern urban lifestyles, now spread the world over, depend on the continued oppression of multiple and multi-species Others. This inconvenient truth gives the lie to the ideas of freedom, equality, and justice that are claimed by civilized people. The other inconvenient truth is that civilization as we know it is doomed—if we are to engage with climate change in a way that allows us to survive, we need wide, sweeping infrastructure changes that emerge from alternative ways of thinking and being. Indigenous cultures offer us some of these alternative visions. Ghosh makes another important point almost in passing—speaking of engineers who built cities, bases, and nuclear power plants in regions of high risk from cyclones or tidal waves (Fukushima, for example), he notes that hubris and predation are not the only reasons why such risky propositions became normalized. The scales of natural phenomena were such as to be beyond the imaginations of these practical men, used as they were to the “regularity of bourgeois life.” But also they were able to function through creating discontinuities, “breaking problems into smaller and smaller puzzles until a solution presented itself.” This is, of course, reductionism. Although Ghosh does not discuss this idea further, it is very relevant. Reductionism and its manifestations—from individualism, human isolation, social atomism, and mainstream economics with its idea of the individual exercising rational self-interest for the good of all—are features of a certain paradigm that one might call Newtonian (although its roots precede Newton, who would have balked at some of its implications) or Mechanistic, its model being the Clockwork Universe: the universe and everything in it presented as a giant machine. A history-of-science lens would have added some richness to Ghosh’s analysis, especially given his ability to illuminate history’s relationship with our present. One can argue that Newtonian paradigm extends beyond science to socio-economic aspects of modern industrial civilization. Perhaps it is both the offspring and the parent of modernity. I would love to read a historian’s informed and detailed elucidation of all of this, but from my scattered and eclectic readings on the subject, a certain irony becomes evident that is centered on physics. Despite the apparent prevalence of the Newtonian way of thinking in every aspect of our lives, the universe is not Newtonian. We are well aware that quantum physics and relativity tell us this, but they are far removed from human scales. There is another less famous ongoing revolution in physics (and indeed it goes beyond science) which is the science of complex systems. Despite its roots in the 1800s, complex systems science has had a very late start. This is—I suspect—in part because of the phenomenal success of the Newtonian paradigm, and its easier cooptation by power. (That anything can be coopted, however, is exemplified in the popularity of “systems thinking” in the business world—hear that buzzing sound?) But it is complex systems science—or more likely, some future formulation of it—that can eventually help us engage with real-world systems like global climate. Complex systems cannot be understood solely by examining their “parts”—reductionism only goes so far. For them, “the whole is greater than the sum of its parts,” as Aristotle famously said. Current explorations of complex systems (and perhaps the field itself) are still handicapped by a Newtonian way of thinking. Notably, old cultures, including many indigenous tribal cultures, typically view the world from a complex systems perspective. Thus, climate is a complex system—land, biosphere, air, water, ice caps, and human civilization interact so strongly with each other that Cartesian predictability and determinism are of limited usefulness and relevance. While certain predictions in the aggregate are possible, complex systems present us with an array of “new” phenomena—stabilizing and destabilizing feedback loops, tipping points, and unintended consequences. They call for alternate ways of conceptualizing, thinking, living, and being. They are the cracks in the imposing edifice of the Clockwork Universe. While the implications of climate data are clear—we must stop the emission of greenhouse gases and the destruction of carbon sinks such as tropical forests—the possible pathways to that future are complicated and uncertain. We need a huge worldwide shift to green energy infrastructure, a process that is already underway (if slowly), but we also need an equally seismic shift away from consumerism, the foundational basis of the globalized neoliberal economy. This is a complex (but not necessarily very long) process that cannot be modeled mechanistically. While ecologists and endocrinologists (for example), have known for a long time that mechanistic models of ecosystems or of the endocrine system are of limited usefulness, certain applied physicists and technologists have yet to learn that lesson. The idea of geoengineering, or climate engineering—the large-scale tinkering with Earth’s systems to cool the planet—is a case in point. Apart from its ethical implications and the troubling fact that it has been incubated in fossil fuel companies and big US government labs, the problem with geoengineering is that it treats the Earth like a Newtonian machine rather than a complex system, with all the implications—the separation of the scientist-technologist from their object of study, the assumption of simplistic and deterministic “solutions,” the desperate, fear-induced seeking of control, which can only be illusory, and the looming shadow of unintended consequences, which could potentially make the problem worse. Geoengineering is the illusion that we can avoid the long, hard road, the paradigm shift, and instead, “fix” what is broken in the Earth’s climate. A friend who attended a geoengineering conference recently reported to me that when he asked the attendees about the sociopolitical and ethical aspects of their work, most of them demurred, saying they were “just scientists,” a response that is surely in the same ethical category as “I was just following orders,” or “I was just doing my job.” This separation of the person from the task and the task from its possible consequences is surely a kind of moral reductionism. Perhaps the usefulness of that oft-contested term paradigm  lies simply in making us aware that our default assumptions, our frameworks for making sense of the world, are not absolute givens. I wonder if we can explain, in part, the actions of the engineers who built Fukushima in violation of the warnings placed by their ancestors on that troubled shore, or the geoengineering fantasies of technological quick-fixes, as resulting from (for lack of a better phrase) paradigm blindness. What if they are so immersed in a particular way of constructing reality that they have no other way of seeing? Here lies the true value of imaginative literature—the potential to free us from our mental constructs, so that we may question our default assumptions and see what we didn’t see before. To think that matter matters only to the extent of being able to manipulate it to the ends of the current socio-economic system is to ignore what it is also telling us about its complex entanglements across geographies and times. To theoretical physicists anyway, even those raised in the reductionist traditions, matter has always mattered in the deepest sense. It is fundamentally the case that laws of Nature constrain how matter manifests and behaves. Thus the idea that there are natural limits to human activity, that we are subject to boundaries due to Nature’s laws, is hardly surprising. Stockholm University’s Resilience Center has come up with nine planetary boundaries, within which lies humanity’s “safe operating zone.” Only mainstream economists seem to have a problem with this concept, and indeed with the first two laws of thermodynamics. But they have forgotten that matter also speaks, and it does not always say what they want to hear. My own explorations (as the wide-eyed physicist) in the realm of new materialism, a collection of movements in different fields that challenge anthropocentricism and bring in non-human and inanimate actors, convince me that these ideas are important (and also that they are not new—as various unheard Others might attest). The works of many of its explorers and adherents suggest that when we interact with each other and with the animate and inanimate universe, we build worlds, and that matter and non-humans co-create these worlds with us. Concepts to which we ascribe an independent existence truly arise from how we build worlds—that is, without context they are meaningless. Such approaches promise to provincialize ideas and concepts that modernity takes for granted, and perhaps modernity itself. The threat of backwardness is in part the driver of “development” in previously colonized nations, as Ghosh points out. I believe it is also a convenient excuse for the ongoing war against indigenous peoples being waged by neoliberal governments from India to the US. Thus “progress,” “development,” “backwardness” are terms that need to be looked at not as self-evidently meaningful, but in the context of their socio-cultural emergence. Ghosh does refer indirectly to new materialism concepts, but a deeper treatment (including exploration of the ideas of Donna Haraway and Karen Barad) would have enriched the work (a volume II?). At one point in the book, Ghosh wonders whether we will ever ask questions like “where were you when—” in the context of climate, as we do for catastrophic events like 9/11. Where was I when the Larsen C ice shelf broke off? On July 12, 2017, I was in a classroom, co-running a workshop on climate change for middle school and high school teachers, feeling inadequate before the enormity of the task. The ice shelf had been expected to break off for some time, but when it did, I felt a shock, a sinking of the heart, a faultline separating “before” and “after.” What allowed me to survive the feeling was the presence of others in the room and in the world who experienced something similar. If we are to ask such questions—where were you—when the Larsen C ice shelf broke off—when the North Pole became ice-free in summer for the first time—when the Himalayan glaciers melted—if we are to ask them, we must be willing to gaze into the possibility of sheer hell. Who wants to do that? And who can do that alone? These are some of the most chilling words I’ve ever heard, rivaled only by the obedient silence of the students. One problem with our collective silence on the subject of climate change is that while we pretend life is going to go on as usual, there are others who are deliberately planning for control of a climate-changed world. Imagine a highly militarized, totalitarian, automation-based, habitat-destroying, water-starved future of perpetual war within and among nations, with captive populations ground down by scarcity and failing infrastructure, held in thrall by contrived loyalties and addictions peddled by mass media, where mass extinctions and the deaths of millions of refugees are barely noted except with a Malthusian shrug of the shoulders—while the super-rich live in fortified, climate-protected luxury bunkers or occupy a greening Antarctica and fly to the corporate-owned moon for vacation. It sounds like a bad science fictional dystopia. But some of the steps along that path have already been taken. There is a steep price for silence. Despite Ghosh’s dismissal of SF in the context of climate change, the book is dotted with science fictional references. The opening page recalls a scene from Star Wars; then there is the mention of Mount Tambora’s eruption that gave us Frankenstein; and a certain starship on a popular television show shares a name with the first coal-fueled steamer service (1825) between India and England—The Enterprize. Science fiction—speculative fiction in general—resists being denied. 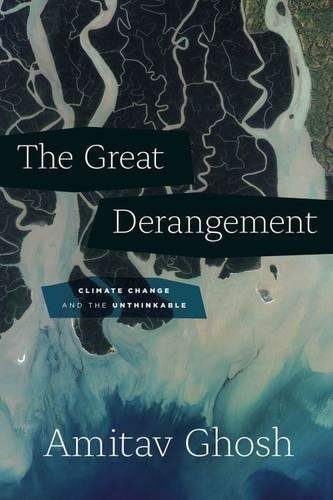 Climate change, that great multi-headed monster, is the creation of a certain section of humankind, a certain overarching mindset or paradigm (despite the all-embracing term “Anthropocene”). As Ghosh acknowledges, it is ultimately a problem of the imagination. We must acknowledge that imaginative literature—no literature—can ever be enough. We are called to do much more than write or run workshops—to face the possibility of hell itself, and then to get to work. But when we pick up the pen, can we write to the challenge? Can we move beyond apocalypse-du-jour to radically imagined, seismic conceptual shifts whose reverberations change minds, hearts, and worlds? Can we begin by breaking the spiral of silence? A magnificent essay, some of the most important writing SH has yet published. Thank you so much. Fantastic essay. She never once mentions cli-fi though. Weird. Uncanny. Is she blind? Or just prejudiced as a member of the sf cult? Professor?